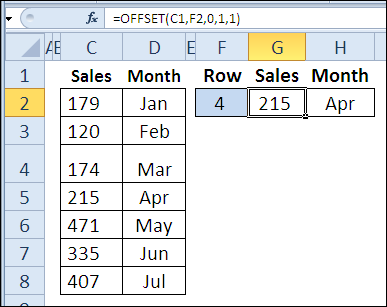 Use the OFFSET function to refer to a range, based on a starting cell. 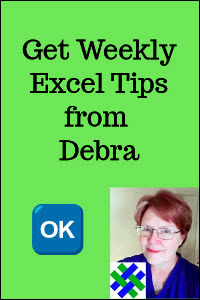 For example, get the total sales for April-June (start in column 4, include 3 columns). In this video, you'll see four examples of how to use the OFFSET function. The written instructions are below the video. 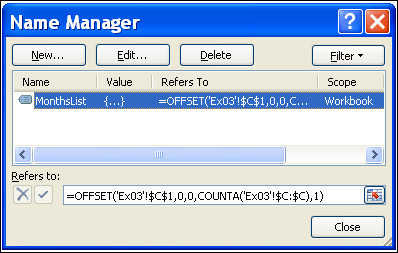 The OFFSET function is volatile, so it could slow down a workbook if used in too many cells. Instead, you could use a non-volatile function, like INDEX, to return a reference. reference: a cell or range of adjacent cells. rows: Rows to move from starting point; can be positive (below starting reference) or negative (above starting reference). 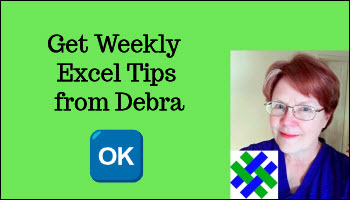 width: If entered, number must be positive, and is number of columns in returned reference. 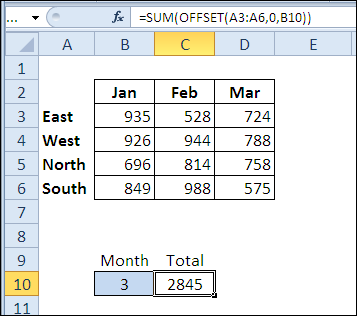 In cell H2, there is a similar OFFSET formula, to return the month name. The only difference is the column offset -- 1 instead of zero. Note: The height and width arguments could be omitted, because we want a reference that is the same size as the starting reference. I used them in this example, to show how all the arguments work. 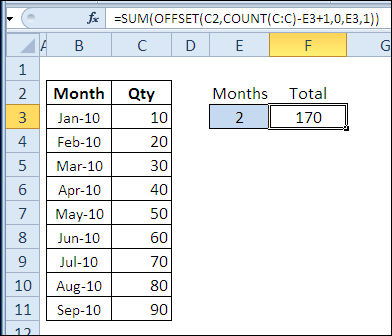 In this example, the OFFSET function returns a reference to the sales amounts for the selected month, and the SUM function returns the total for that range. In cell B10, the selected month number is 3, so the result is the total of the March sales. 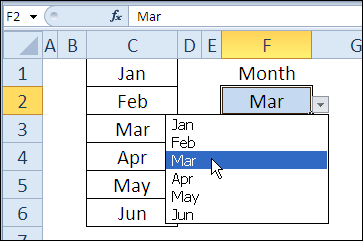 If another month is added to the list in column C, it will automatically appear in the data validation drop down list in cell F2, which uses MonthsList as its source. In this final example, OFFSET is combined with SUM and COUNT, to show the total for the last n months. 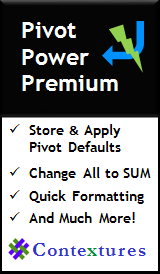 As new quantities are added, the formula result will automatically adjust to include the latest months. In cell E2, the number of months is 2, so the August and September amounts are summed.